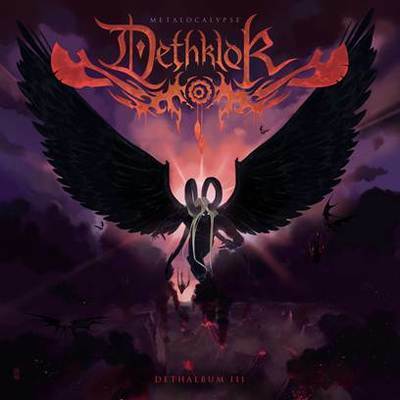 DETHKLOK plans to release Metalocalypse: Dethklok Dethalbum III, their anticipated follow-up album this fall. The stars of the Adult Swim series Metalocalypse will unleash 12 brand new tracks that are more brutal than ever before, which is set to hit stores throughout North America on October 16th from Williams Street Records. The Dethalbum III is once again co-produced by Metalocalypse co-creator Brendon Small and DETHKLOK producer Ulrich Wild (The Dethalbum and Dethalbum II). Dethalbum III will not only be released in its original CD and digital format, but also as a Deluxe Edition CD/DVD and a clean version of the CD. The Deluxe Edition CD/DVD will include a 32-minute behind-the-scenes documentary of the making of Dethalbum III, as well as music videos and much more. A vinyl edition of the album with special etching will be released on November 6th. The fourth season of Metalocalypse, created by Brendon Small and Tommy Blacha with Small executive producing, recently wrapped on Adult Swim and will be released on DVD and Blu-ray Disc on October 30th. Along with all 12 episodes from the series’ fourth season, the Metalocalypse Season 4 DVD and Blu-ray releases will feature more than two hours of special features. Highlights from those features include a 90-minute feature film of Nathan Explosion tackling his latest Shakespeare reading, in “Nathan Reads Shakespeare 4: Comedy of Errors,” a series of band member “StaresDowns,” a look at DETHKLOK Fan Art, “MurderThoughts,” a “Pickles Flyby” and much, much more. More details, including pre-order information and a corresponding fall tour for DETHKLOK, are set to be announced shortly. Stay tuned for an assault of new information, multimedia and exclusives coming very soon.